Benny Goodman, born Benjamin David Goodman, (May 30, 1909 – June 13, 1986) was an American jazz clarinetist and bandleader, known as the "King of Swing." Perhaps the most brilliant clarinetist of jazz, Benny Goodman was also one of its prime bandleaders. Though he was by no means the first to play in the swing style, his rise to fame in the mid-1930 heralded in the “swing craze” that would last approximately a decade, bringing jazz fully into the mainstream in the process. This makes Goodman one of the most influential musical figures of the twentieth century, though one can argue that his music was not as groundbreaking as that of Fletcher Henderson, Duke Ellington or Count Basie, his prime rivals in the big band era. Goodman was a musical perfectionist and his performances always had an impeccable quality. Unlike many other white swing bands, he always remained firmly grounded in the jazz tradition and he made history by hiring black star musicians into his all-white band. Goodman was born in Chicago, the ninth of 12 children of poor Jewish immigrants from Eastern Europe. His father, David Goodman, was a tailor. Benny learned to play clarinet in the local synagogue and soon joined a Hull House-run band. Also important during this period were his two years of instruction from the classically trained clarinetist Franz Schoepp. This would explain Benny’s ability to be equally at ease in jazz and in the classical environment. His early influences were New Orleans jazz clarinetists working in Chicago, notably Johnny Dodds, Leon Roppolo, and Jimmy Noone. Goodman learned quickly and became a strong player at an early age. He was soon playing professionally while still 'in short pants', playing clarinet in various bands and participating in jam sessions with musicians of the Chicago scene, including Bud Freeman and Red Nichols. When Goodman was 16, he joined one of Chicago's top bands, the Ben Pollack Orchestra, with which he made his first recordings in 1926. He made his first record under his own name two years later. Remaining with Pollack through 1929, Goodman recorded with both the regular Pollack band as well as smaller groups drawn from the orchestra. The side sessions produced scores of often hot sides recorded for the various dime-store record labels under a bewildering array of group names, such as Mills' Musical Clowns, Goody's Good Timers, The Hotsy Totsy Gang, Jimmy Backen's Toe Ticklers and Kentucky Grasshoppers. Goodman's father, David, was a working-class immigrant about whom Benny said (interview, 'Downbeat', Feb 8, 1956) "… Pop worked in the Union Stock Yards, shoveling lard in its unrefined state. He had those boots, and he'd come home at the end of the day exhausted, stinking to high heaven, and when he walked in it made me sick. I couldn't stand it. I couldn't stand the idea of Pop every day standing in that stuff, shoveling it around." On December 9, 1926 David Goodman was killed in a traffic accident shortly after Benny joined the Pollack band. It was a bitter blow to the family, and it haunted Benny to the end that his beloved father had not lived to see his enormous success. Goodman left for New York City and became a successful session musician during the late 1920s and early 1930s. He made a reputation as a solid player who was prepared and reliable. He played with the nationally known bands of Ben Selvin, Red Nichols, Isham Jones and Ted Lewis before forming his own band in 1932. In 1934 he auditioned for NBC's Let's Dance, a well-regarded radio program that featured various styles of dance music. Since he needed new charts every week for the show, his agent, John Hammond, suggested that he purchase jazz charts from Fletcher Henderson, who had New York's most popular African-American band in the 1920s and early 1930s. The combination of the Henderson charts, his solid clarinet playing, and his well-rehearsed band made him a rising star in the mid-1930s. In early 1935, Goodman’s "Let's Dance" radio broadcasts from New York had been too late to attract a large audience on the East Coast, but had an avid following in California, and a wildly enthusiastic crowd for the first time greeted Goodman. He and his band were to remain on the show until May of that year when a labor strike forced the cancellation of the radio show. With nothing else to do, the band set out on a tour of America. However, at a number of engagements the band received a hostile reception, as many in the audiences expected smoother, sweeter jazz as opposed to the "hot" style that Goodman's band was accustomed to playing. By August of 1935, Goodman found himself with a band that was nearly broke, disillusioned and ready to quit. It was at this moment that everything for the band and jazz changed. The last scheduled stop of the tour came on August 21, 1935 at the Palomar Ballroom. Goodman and his band were scheduled for a three-week engagement. The Palomar provided the ideal environment, as there was a huge dance floor with a capacity of 4,000 couples. On hand for the engagement were famed musicians Gene Krupa, Bunny Berigan and Helen Ward. 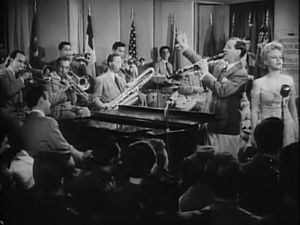 At the beginning of the next set, Goodman told the band to put aside the stock arrangements and called for charts by Fletcher Henderson and other swing arrangers who were writing for the band. When trumpeter Bunny Berigan played his solos on Henderson’s versions of "Sometimes I'm Happy" and "King Porter Stomp," the Palomar dancers cheered like crazy and exploded with applause! They gathered around the bandstand to listen to this new music. Over the nights of the engagement, a new dance labeled as the "Jitterbug" captured the dancers on the floor, and a new craze had begun. Onlookers gathered around the edges of the ballroom floor. Within days of the opening, newspapers around the country were headlining stories about the new phenomenon that had started at the Palomar. Goodman was finally a nationally known star, and the Swing Era had arrived. Following this, the big band era exploded. In late 1937, Goodman's publicist attempted a publicity stunt by suggesting Goodman and his band should play Carnegie Hall in New York City. The very idea of a jazz orchestra playing in such a renowned concert hall, the home of classical music, seemed unreal, but the times had already begun to change and, after some hesitation, Goodman decided to fully focus on the project. The concert was scheduled for January 16, 1938. It sold out weeks before, with the capacity 2,760 seats going for the top price of US$2.75 a seat, for the time a very high price. It has been reported that Goodman himself was forced to buy tickets for his family on the black market. Goodman had invited some of the top stars from the Count Basie and Duke Ellington orchestras, including Basie himself and Lester Young, to appear on the evening. Yet, success rather came from the pleasant vocals of Martha Tilton and Benny’s small combo performances. The evening ended in resounding applause with Benny’s signature tune, “Sing, Sing, Sing” adroitly combined with Fletcher Henderson’s “Christopher Columbus.” Following thunderous solo work by Harry James and Gene Krupa and a cool tenor solo by Babe Russin, blending in with occasionally bombastic ensembles, Goodman offered a smooth, strangely quiet, almost classical clarinet solo ending on an impressive high C. When all seemed done, Goodman unexpectedly asked pianist Jesse Stacy to play a solo that was totally unprepared but became a historical landmark, forming the perfect continuation of Benny’s impressionistic, yet jazz-filled playing. This concert has been regarded by some as the most significant in jazz history. After years of work by musicians from all over the country, jazz had finally been accepted by mainstream audiences. While the big band era would not last much longer, it was from this point forward that the groundwork for multiple other genres of popular music was laid. In 1950, an LP release of the concert’s acetate recordings was made and became one of the first LPs to sell more than a million copies. In early 1998, the aluminum masters were rediscovered and a new, better quality CD set of the concert was released. Goodman continued his meteoric rise throughout the late 1930s with his big band, his trio and quartet, and a sextet. These small formations pioneered the “chamber music” style of jazz, an approach that would combine the hot quality of the music with a sort of restrained elegance not found in earlier styles. They also provided Goodman with the best opportunity to express his artistic talent among his peers. Goodman influenced almost every jazz musician who played clarinet after him. By the mid-1940s, big bands lost a lot of their popularity, in large part because many musicians were entering the service during World War II and because there were two long recording strikes. More fundamentally, tastes began to change and popular singers such as Frank Sinatra entered the scene. Jazz itself was revolutionized by bebop, which was more remote from popular music and more suited for small combos. Goodman reluctantly embraced some of the bebop style in the late 1940s and early 1950s with less commercial success, although the recordings he made in that style were praised by jazz critics. The fact is that Goodman never felt really at ease in the bop environment. He finally broke up his big band in 1952. In later years, he would revert to his original swing style. Additionally, Goodman held an interest in the classical music works written for clarinet, and frequently met with top classical clarinetists of the day, even venturing into learning an entirely new clarinet technique appropriate for classical music. He twice recorded Mozart's Clarinet Quintet, once in the late 1930s with the Budapest String Quartet and once in the middle 1950s with the Boston Symphony Orchestra String Quartet; he also recorded the clarinet concertos of Wolfgang Amadeus Mozart, Carl Maria von Weber, and Carl Nielsen. More importantly, Goodman commissioned and premiered works by leading composers for clarinet and symphony orchestra that are now part of the standard repertoire, namely Contrasts by Béla Bartók, Clarinet Concerto No. 2 Op. 115 by Malcolm Arnold and Aaron Copland's Clarinet Concerto. While Leonard Bernstein's Prelude, Fugue, and Riffs was commissioned for Woody Herman's big band, it was instead premiered by Goodman. Igor Stravinsky’s Ebony Concerto, by while written for and actually premiered by Woody Herman, was later re-recorded by Stravinsky with Goodman on clarinet. Though Benny Goodman was known for his perfectionism and the impeccable timing of his band; that alone would not have been enough to make him famous. Like all other great artists, Goodman had his own, immediately recognizable sound, both on clarinet and with his band. Though Benny himself grew up on the Chicago jazz scene of the late 1920s that was dominated by Bix Beiderbecke, and though his band entirely consisted of white musicians (in accordance with the times), his closest musical affinity is Fletcher Henderson, and African-American jazzman whose orchestra pioneered the big band sound around 1930. By the mid-1930s, Henderson’s declining ensemble was gradually eclipsed by the emerging Goodman band, playing in much the same way, with a different touch. There was also a direct continuity: Henderson, one of the greatest arrangers of jazz, contributed many arrangements to Goodman and eventually joined him full-time. Goodman would play the Henderson charts with surgical precision and a very “dancy” swing quality that was less emotionally hot than Henderson’s music and very appropriate for young white audiences. While Henderson’s band was recognizable from its signature clarinet trios, Goodman’s equivalent would be his section of muted trumpets. Along with the leader’s clarinet solos, their interventions would put Goodman’s stamp on any performance. Goodman was a virtuoso clarinetist and arguably the most technically proficient jazz clarinetist of all time. He certainly was the most influential one. Only Artie Shaw and later Woody Herman would have similar careers, but neither can challenge Goodman’s overall stature. Goodman was a brilliant improviser capable of playing hot solos rivaling those of any jazz great. In fact, he is perhaps the only white jazz musician ranking at the top of his instrument. Goodman did not own a particularly pure sound. Clarinetists like Barney Bigard and Johnny Dodds perhaps surpassed him in sheer artistic quality and certainly in their ability to play the blues. Goodman’s strength was more his masterful control over all aspects of his playing, allowing him to squeeze dynamic, raucous sounds out of the clarinet as well as producing long improvised lines of unequalled fluidity. He was perfectly at easy in all registers of his instrument. There is a parallel between what Goodman did with jazz and swing and what Elvis Presley would do for rock and roll. Both helped bring black music to a young, white audience. Many of Goodman's arrangements had been played for years by Fletcher Henderson's African-American Orchestra. But, while Goodman publicly acknowledged his debt to Henderson, many young white swing fans had never even heard that band. There has always been some controversy over the evaluation of Goodman’s legacy. While some consider him a key jazz innovator, others maintain that his main strength was his perfectionism and drive. No one can deny the significance of his contribution, but the very fact of his popularity as sometimes backfired, with some critics considering that his position in jazz history is unjustified. Many would argue that Count Basie was the real king of swing and that Goodman’s artistic legacy cannot be compared with that of Duke Ellington or others, including his mentor of sorts, Fletcher Henderson. At times, the backlash went so far as to deny Goodman and other white swing bands any real jazz quality. While it is true that some of these bands often reached commercial success at the expense of some of jazz’s key elements, that hardly applies to Goodman and it is unfair to blame him for having had the commercial advantage of his racial background. Goodman is also responsible for a significant step in racial integration in America. In the early 1930s, black and white jazz musicians could not play together in most clubs or concerts. In the Southern states, racial segregation was enforced by the Jim Crow laws. 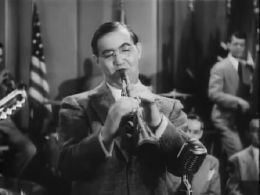 Benny Goodman broke with tradition by hiring Teddy Wilson to play with him and drummer Gene Krupa in the Benny Goodman Trio. In 1936, he added Lionel Hampton on vibes to form the Benny Goodman Quartet; in 1939 he added pioneering jazz guitarist Charlie Christian to his band and small ensembles. Christian played with him until his untimely death from tuberculosis less than three years later. Trumpet great Cootie Williams was similarly hired away from the Ellington band. This would open a trend for successful white bands to hire black star musicians, which in itself was a testimony of the prestige these musicians had with their white colleagues. To give an understanding of American history at this time, Goodman's integration of popular music happened ten years before Jackie Robinson entered Major League Baseball. "[Goodman's] popularity was such that he could remain financially viable without touring the South, where he would have been subject to arrest for violating Jim Crow laws." On March 14, 1942, Benny married Alice Hammond Duckworth, who was a member of America’s financial aristocracy and the sister of Benny’s friend, the great talent scout John H. Hammond. Benny and Alice had two daughters: Benjie and Rachel. Both studied music to some degree, though neither became the musical prodigy Goodman was. It is Hammond, who also discovered Count Basie among many others, who had encouraged Goodman to integrate his band, having persuaded him to employ pianist Teddy Wilson. He all but forced Goodman to audition Charlie Christian, Goodman believing no one would listen to an electric guitarist. Goodman continued to play on records and in small groups. Aside from a collaboration with George Benson in the 1980s, Goodman generally continued to play in the swing style he was most known for. He toured the world as America’s musical ambassador and was the first jazz musician to perform in the Soviet Union (Benny Goodman in Moscow, 1962). Despite increasing health problems, he continued to play the clarinet until his death from a heart attack in New York City in 1986 at the age of 77. A longtime resident of Pound Ridge, New York, Benny Goodman is interred in the Long Ridge Cemetery, Stamford, Connecticut. The same year, Goodman was honored with the Grammy Lifetime Achievement Award. Benny Goodman's musical papers were donated to Yale University after his death. Goodman's success story was told in the 1955 motion picture The Benny Goodman Story with Steve Allen and Donna Reed. A Universal-International picture, it was a follow up to the successful The Glenn Miller Story in 1953. The soundtrack features Goodman’s own clarinet and a several original musicians of the band appear in the movie as well. Goodman was regarded by some as a demanding taskmaster, by others an arrogant and eccentric disciplinarian. Many musicians spoke of "The Ray," Goodman's trademark glare that he bestowed on a musician who failed to perform to his demanding standards. Anita O'Day and Helen Forrest spoke bitterly of their experiences singing with Goodman. Musicians also told stories of Goodman's notorious cheapness, continuing to pinch pennies as he had in his poverty stricken youth long after he had attained fame and fortune. He reportedly would skip out on the bill in restaurants, and was stingy with sidemen. At the same time, there are reports that he privately funded several college educations and was sometimes very generous, though always secretly. ↑ Benny Goodman, NNDB. Retrieved June 20, 2007. ↑ The Benny Goodman Story (1955), INDB. Retrieved June 20, 2007. Collier, James Lincoln. Benny Goodman and the Swing Era. New York: Oxford University Press, 1989. ISBN 9780195052787. Connor, D. Russell and Warren W. Hicks. BG on the record; a bio-discography of Benny Goodman. New Rochelle, N.Y.: Arlington House . ISBN 9780870000591. Crowther, Bruce. Benny Goodman. London: Apollo, 1988. ISBN 9780948820045. Erenberg, Lewis A. Swingin' the dream : big band jazz and the rebirth of American culture. Chicago: The University of Chicago Press, 1998. ISBN 9780226215167. Firestone, Ross. Swing, swing, swing: the life & times of Benny Goodman. New York : Norton, 1993. ISBN 9780393033717. Goodman, Benny. Benny, king of swing: a pictorial biography based on Benny Goodman's personal archives. New York: W. Morrow, 1979. ISBN 9780688035020. Goodman, Benny and Irving Kolodin. The Kingdom of Swing. (original 1939) Reprint Services Corp, 1993. ISBN 978-0685148686. This page was last modified on 14 December 2016, at 16:37.